In part one, Juan talked about the sequence of events fired when loading a form with a number of subforms in Access and how one can reduce the cascading effects of events being refired due to operations performed during the load. We will talk about how we can delay loading the subforms. By putting off the load of subform, we not only ensure that the parent form can fully load first but also we reduce the overall burden by only using subform that the user actually requests. If you’re on Access 2010 or newer, and you’re working on a new project, you should definitely look at the Navigation Control introduced in Access 2010. It’s basically a tab control and a subform control combined into a powerful navigation system. Best of all, it enables delayed loading all for free, with no coding required on your part. Each time you switch a tab on the navigation control, the old subform is unloaded then the new subform get loaded. This is very good thing if your users usually need to visit a subform once and don’t need to flip between subforms that often. However, navigation control isn’t always a perfect fit. For one thing, you might have to support Access 2007 or earlier. Other consideration is if you need two subforms to be able to interact with each other, you can’t really do that with a navigation control which always has a single subform loaded at all time. Finally, maybe your user workflow is such that they do need to be able to flip between two subform quickly and therefore would prefer to trade in slower initial loading time for faster time to flip between two tabs or have one main subform loaded at all times and delay load only the additional tabs. Most of time, when a form has multiple subforms, we’ll be putting them on a tabcontrol, each tab page housing a single subform. Note that it is also possible to use a single subform control with an option group of buttons or similar control(s) instead which give us very similar behavior to navigation control but also the same problem — inability to load & cache a subform. So for the rest of article, we’ll be working with the tab control + subform control in each tab page design pattern. The first step is to not load any form into the subform control. Typically, we’d set the SourceObject property to a form or a report on a subform control. In this case, we’d blank it out. With this change, we are able to delay the loading and ensure that loading only occurs exactly once as long as the parent form is kept open. 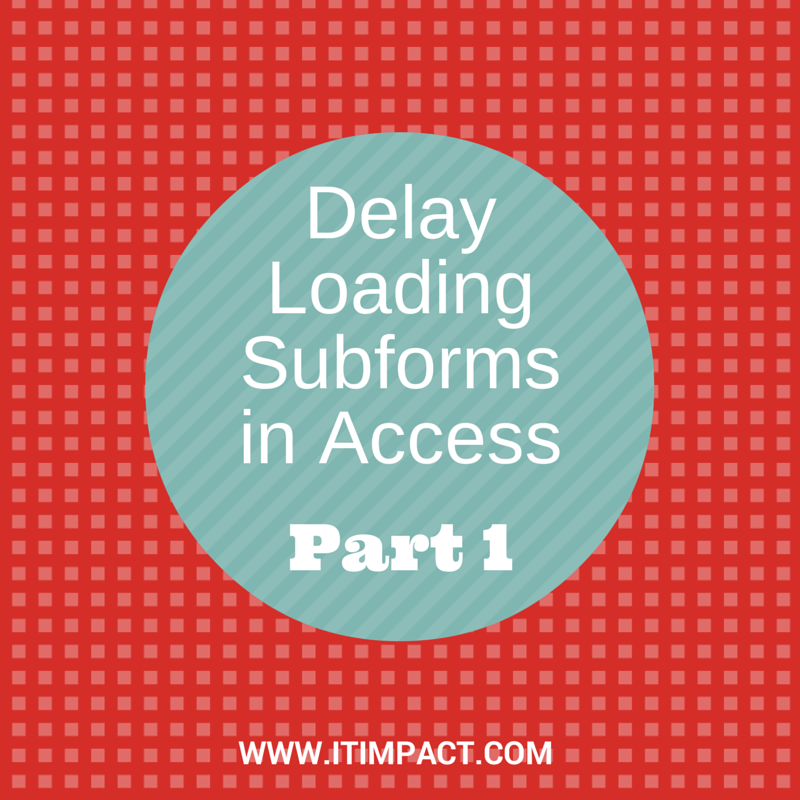 This approach helps us spread out the cost of loading a subform so that the parent form can load quickly and only delay a bit longer when the user selects one of the tab. Frequently, one of those tabs are also the default tab that you want to show on the page so in this case there might be no point of delay-loading this one subform. In this scenario, we would just leave the SourceObject property populated and skipping. This is why the sample code shown deal with 2nd page and onward, rather than with the first page. This sample also assumed that we would be using the built-in form-subform linking by leaving in the LinkMasterFields and LinkChildFields properties filled. However, we’ve found that sometimes we need the extra control such as being able to specify more specific filter that is set by the user on the parent. Sometimes it’s just that the linking is not needed, especially on a main form where an user may start different workflows that are unrelated to each other. This is only a start but hopefully by now, you have a good idea of how far you can go with the manual control of the subform’s loading and if necessary, the filtering. However, when the parent form has navigated to a different record, and you either find that the linked subforms thats already loaded takes too much time or that unlinked subforms are now out of synchronization. We need to deal with this situation. The problem with the linked subform is that unless you use a custom navigation system, you cannot easily intercept when the users has clicked the navigation bar’s buttons to navigate to another record. Unloading the subform on a parent form’s Current event would be too late because the navigation would force the linked subform to re-filter. If you do not want to use a custom navigation system then you may have to consider using unlinked subform and managing the filtering yourself. It may be the case that in some workflows, the users wants to be able to stay on the same tab when navigating to a different parent record. This is easy to accomplish by checking the value of the tab control and skipping the setting of subform’s SourceObject property to vbNullString. Hopefully, the samples provided will give you a good idea of how you can improve the user’s experience by taking more control of how the subform loads and if necessary, unlink the subform and manage the filter yourself. If you have any better ideas or want to share experience, please do in our comments. Thanks for the very helpful article. We’re working on upgrading a very large Access 2003 application and have run into this very problem in Access 2010, 2013 and 2016. Subforms load in an inconsistent order, meaning sometimes everything works fine and the next time you get strange errors that never happened in Access 2003. We’re in the process of trying this solution to confirm it will solve these problems for us. We’ve actually used the blank SourceObject propery for many subform objects already, but for a different reason. Our application has numerous subforms. Many of our parent forms have tabs with about 15 subforms. We found that if our users kept several parent forms open, they’d eventually get out of memory errors, due to each form and subform object consuming a window handle. Keeping the subform control’s SourceObject property blank avoids using a window handle until you actually set that property to a form object. We now set SourceObject to blank for almost all subforms on tab pages that aren’t visible. This helps our parent form to load quickly. Switching between tab pages has a slight delay, but users can now keep many more forms open than before!